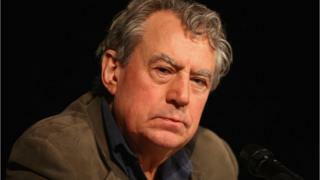 Monty Python star Terry Jones has been diagnosed with a severe variant of dementia. The 74-year-old has primary progressive aphasia, which affects his ability to communicate. As a result, Jones "is no longer able to give interviews", his spokesman said. The news was confirmed as Bafta Cymru announced the Welsh-born comedian is to be honoured with an outstanding contribution award. The National Aphasia Association describes primary progressive aphasia as a neurological syndrome in which language capabilities become slowly and progressively impaired. "It commonly begins as a subtle disorder of language, progressing to a nearly total inability to speak, in its most severe stage," their website states. Jones, who is from Colwyn Bay in north Wales, was a member of the legendary comedy troupe with Terry Gilliam, John Cleese, Eric Idle, Michael Palin and the late Graham Chapman. He directed Monty Python's Life of Brian and The Meaning of Life and co-directed Monty Python and the Holy Grail with Gilliam. The surviving members reunited for 10 reunion performances at the O2 Arena in London in 2014. Kathryn Smith, director of operations at Alzheimer's Society, said: "We are deeply sorry to hear about Terry Jones's diagnosis of dementia and are thinking of Terry and his family during this time." His award was announced at the Bafta Cymru nominations party, ahead of the British Academy Cymru Awards on 2 October. "Terry is proud and honoured to be recognised in this way and is looking forward to the celebrations," his spokesman said. Hannah Raybould, director of Bafta Cymru, said: "We are very much looking forward to celebrating the work of Terry Jones during the ceremony with a look back at his work from 1969 to the present day." Follow us on Twitter @BBCNewsEnts, on Instagram, or if you have a story suggestion email entertainment.news@bbc.co.uk.